From the car park, stone steps lead up to a gate and the front door. Entrance leads into the combined lounge / dining / kitchen area with views towards Scafell. Open plan wooden steps lead down to the bedroom, which has stone walls and oak beams. A door leads from the bedroom to the bathroom which has a traditional slipper bath, hand basin and WC. From the kitchen window and garden there are views towards Scafell , Bow Fell and Crinkle Craggs. 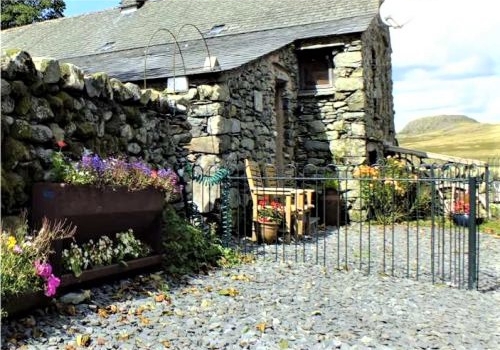 An enclosed private garden surrounds two sides of the Bothy with a patio area at the top from where you have spectacular views towards Scafell. There is also use of a nearby field. Our automated availability and booking system for The Bothy is below, but please contact us if you have any questions. We're here to help! To see the available accommodation, please select your arrival and departure dates and guest numbers (maximum of 2 in The Bothy). 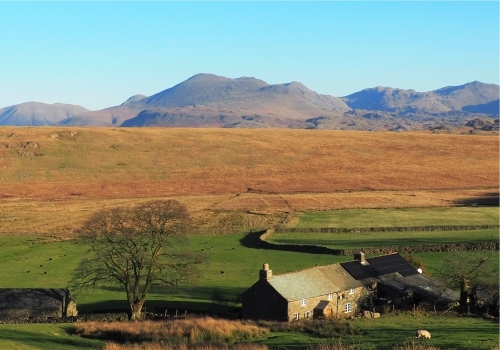 Traditional cottage offering sccommodation for two to six people with magnificent views of Scafell Pike.